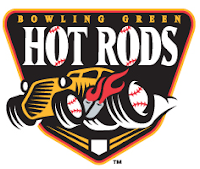 The Bowling Green Hot Rods started the season with back to back wins but then lost three straight games to end the week, resuling in a 2-3 record for the first week of the season. The Hot Rods are currently tied for second in the league, three games back from the leader. Disabled List: Jairo De La Rosa and Lenny Linsky. The Week Ahead: 4/11/12: at West Michigan White Caps (3-3). 4/12/12-4/15/12: at Lake County Captains (3-3). 4/16/12-4/17/12: vs Great Lakes Loons (2-4).